This film is definitely a favorite of mine, if I could ever compile a list of my favorite dozen or so films it would be somewhere in there. I never tire of watching it and there is always some new little point that I pick up on. I love the casting, even the supporting players like John Williams, Henry Daniell , and Ian Wolfe add to the fun. And there is the delightfully quirky Una O'Connor (like having Elsa Lanchester isn't enough). I notice that this was Una's final film role, she passed away two years later at age 78. Unfortunately it was also Ty Power's last film as well, a fine actor who left us way too soon. As RO and Sally mentioned, Marlene Dietrich gives one of her best performances , later she was also part of that terrific cast in JUDGMENT AT NUREMBERG (ironically another court room drama). But in the end for me this is still Charles Laughton's film. Sally is certainly a big fan of his, she did say he is the best English speaking actor ever on film. I would say there is no one better, several others may be considered equals (like Edward G Robinson for instance). RO and Sally briefly mentioned several other standout Laughton films like HUNCHBACK OF NOTRE DAME , MUTINY ON THE BOUNTY, and Sally (I really , really am liking this gal) threw in HOBSON"S CHOICE as a possible future essential. A question: Does anyone know of anyone viewing Witness for the Prosecution for the first time (and knowing nothing about the film in advance) who was able to acccurately predict the surprises at the end? I would suspect that very few ever did. For first time viewers, I suspect that the ending is the final capper of a great suspense ride. Unfortunately, I'll never be able to relieve the thrill of that surprise ending again. But that's one the great things about this masterful courtroom thriller. The film is so wonderfully directed and richly acted by a great ensemble cast, with some marvelous character performers, such as you mentioned, mrroberts, and that wonderful, often witty, dialogue (particularly love the exchanges between Laughton and Lanchester) that I still get a great kick out of repeat viewings of the film EVEN THOUGH I know the ending. You know that a film is a great one, such as Witness, when it holds up so well to repeat viewings. I've read some reports suggesting that Marlene Dietrich was denied an Oscar nomination because the studio, obviously for reasons of elements of surprise for its audience, was successful at keeping her impressive Cockney tart characterization in the film under wraps. Therefore she didn't get as much acclaim as an actress as might have been the case otherwise. It's sad, of course, that this was Tyrone Power's final completed film. However, the acclaim that this film received, plus, I'm sure, Power's own satisfaction at his own contribution to this Billy Wilder production, must have warmed his actor's heart. Power's both winning and sly performance adds a lot to the production. Finally, Witness has one of my two favourite Charles Laughton performances (the other being Hunchback of Notre Dame), both films full demonstrations that this complex English actor could be, when given the right role and director, one of the truly great actors of cinema. With the exception of Hobson's Choice, it had been a long time since the actor had had such a good role. Wilder and Laughton (along with Ty Power) became the best of friends while making this film, and actually spent some time travelling together. Wilder would later recall Witness as having the happiest set of any film that he directed. Five years later the director would tell Laughton that the role of "Moustache" was his in Irma La Douce once he recovered from his bout with cancer. Of course, Laughton wouldn't recover, dying in December, 1962. But what an act of friendship it was for Wilder to fill this old actor's heart with the joy of knowing that a good role awaited him once he was back on his feet again. Wilder and Laughton (along with Ty Power) became the best of friends while making this film, and actually sent some time travelling together. Wilder would later recall Witness as having the happiest set of any film that he directed. 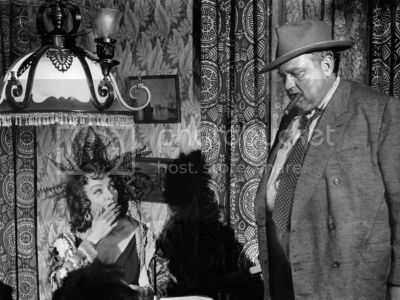 Five years later the director would tell Laughton that the role of "Moustache" was his in Irma La Douce once he recovered from his bout with cancer. Well the first time I saw the film I felt that the women who provided the letters was very likely to be the Dietrich character. The women looked like a man in drag and it was clear this was someone that was putting on an act (from the POV of the plot). So I suspected that Dietrich had some trick up her sleeve to assist Power at that point. But I didn't suspect Power being so out of touch as to humiliate her after she does all that for him and her going off the rail and killing him. Still a very powerful film and ending even when one knows what is going to happen. Maybe I'm a little dumb or not reading between the lines here, but in regards to Dietrich missing out on an academy award nomination I don't see how the "secret" of her playing the mysterious woman with the letters hurt her in the nomination process. Once anyone sees the film and learns at the end that she was that woman we keep that "secret" from the rest of the public but we know what a great performance she did. And the people who determine who gets nominated know of her entire performance in the film and would acknowledge that by nominating her for an award. So where is the excuse for her not getting a nomination? And yet that appears to be the story and even RO and Sally mention it in the intro. Tom, JJG, help me out here. What don't I see? I notice in the opening credits Tyrone Power is first, Marlene is second, and Laughton is third. But clearly Laughton is the center piece of the film. Small point but it shows that he wasn't obsessed with the billing like some other people (Tracy, Bogart come to my mind). Once again I see Laughton working very well with his costars, only "hamming it up" on occasion when it seems appropriate. As for the surprises at the ending, I can't believe too many viewers saw those twists in the story coming. (Similar to finding out that Norman was dressing up as "Mom" and murdering people.) Sally made comment that this film plays a little like a Hitchcock , maybe THE PARADINE CASE influenced this film a little. I love that Sally put in a plug for HOBSON'S CHOICE, that's another film high on my list for repeat viewings. Maybe I'm a little dumb or not reading between the lines here, but in regards to Dietrich missing out on an academy award nomination I don't see how the "secret" of her playing the mysterious woman with the letters hurt her in the nomination process. Once anyone sees the film and learns at the end that she was that woman we keep that "secret" from the rest of the public but we know what a great performance she did. And the people who determine who gets nominated know of her entire performance in the film and would acknowledge that by nominating her for an award. So where is the excuse for her not getting a nomination? And yet that appears to be the story and even RO and Sally mention it in the intro. Tom, JJG, help me out here. What don't I see? Well, mrroberts, for starters, I suspect the Oscar hype from the studio for Dietrich might have been greater if it was better known that she played a dual role. Plus (and I could be wrong here) do all Academy members that vote for a nomination necessarily have had to have seen the performance? Is it not possible that some voted for a performance getting nominated that they didn't see? In that respect, we all know how much pressure or sentiment or hype plays as much a role in these things as artistic considerations. That dual performance hype would have been missing for those who were voting but hadn't actually seen the performance. I notice in the opening credits Tyrone Power is first, Marlene is second, and Laughton is third. But clearly Laughton is the center piece of the film. Small point but it shows that he wasn't obsessed with the billing like some other people (Tracy, Bogart come to my mind). Once again I see Laughton working very well with his costars, only "hamming it up" on occasion when it seems appropriate. By this stage in his career Laughton had long been accepting supporting roles and billing. The compensation for Laughton must have been that, third billed or not, he had a very large part. Certainly the final edited product has more screen time for him than anyone else, and I'll bet that was probably pretty obvious from the screenplay, as well. Likewise, while Power does get top billing (as he had in every film in his career since 1939, the last time he was second billed) he probably saw that Laughton, with whom he had already worked on stage in John Brown's Body, had the lion's share of scenes in the film. I suppose that Ty's ego was not so great as to let that bother him, and he was confident enough as an actor to share scenes with Laughton, a fairly notorious scene stealer throughout his career. Perhaps Power, too, ambitious to prove himself as a "serious" actor, even relished the thought of working with so renowned an actor once again to help keep him on his own toes as an actor. Tom, sadly I have to agree with your speculations about the nomination process. Did the studio do any promotion for Marlene's performance? Probably not. Do the people who are involved in the nominating process get influenced by outside hype and politics? Probably , they do. Is it conceivable that some choose a nominee without having actually seen the performance? Ridiculous but that wouldn't surprise me. It just lessens my opinion of the whole academy award business, not to place too much value in it. It helps explain why an actor like Edward G Robinson never even got a nomination for any of his work. Perhaps all that an Oscar is good for is to use as a door stop. Concerning the billing order for this film, I'm sure the studio (producer ?) makes the decisions here and if any of the actors object, that's a fight that has to be resolved among the principles. It appears that in some cases the billing questions actually weigh in to the decision to take on a part (like Tracy / Bogart in THE DESPERATE HOURS). In the case of WITNESS FOR THE PROSECUTION the billing order was determined by the box office drawing power of the actors involved and there were no objections by those people . People like Laughton, Edward G Robinson, Fredric March, etc were secure enough in their stature as actors to not worry much about such details. Perhaps all that an Oscar is good for is to use as a door stop. Well, it also tells some winners that "You like me. You really like me." No, seriously, it really does send that message, as much as the new Essentials hostess has been kidded for her sincere proclaimation at the the time of receiving her second award. By the way, Dietrich was on record as thinking her own best performance was as the brothel madam in Touch of Evil, even if it was just a cameo. Dietrich's favourite performance of herself. "You should lay off those candy bars, honey. You're a mess." Tracy was to play the role of the father in The Desperate Hours but since Tracy and Bogart couldn't agree on billing March was given the part and of course was billed bellow Bogart. I don't know if these relates to be secure in their status or not (I assume both Tracy and Bogart were very secure by this stage of their career), but it is something Bacall comments on in her book (she couldn't understand it either). "All that an Oscar is good for is to use as a door stop". Sounds like a sour grapes statement, I don't mean that as many who have gotten one don't deserve it or that an Oscar has no value. But it seems to me that the process of nominating and awarding is rather flawed and through the years some very deserving people have been given the short end of the stick. As for Mr Tracy and Mr Bogart, I am a fan of both and admire much of their work. But it appears both men had a high level of insecurity even when they were at the peak of their fame. They were supposedly long time good friends and should have been eager to work together. ( They were together very early in their careers in UP THE RIVER, 1930) Who got "top" billed should have been a non-issue ; flip a coin, draw cards, arm wrestle, or whatever. Just what does Lauren Bacall have to say about this? I know that Tracy called on Bogart just before Bogart died, Tracy was at the funeral (pallbearer?) etc. The interesting thing about that territorial "got to have top billing" competition between Tracy and Bogart is that it occured even though they were the best of friends. In fact, Tracy (accompanied by Hepburn) was, I believe, the last visitor that Bogie saw before he passed away. P.S. : I see, mrroberts, that you just beat me out to saying what I just wrote. Don't forget Tom, I've been in a few westerns too , and am quick on the draw. Bacall doesn't have a lot to say in her book but one things was that the three came to her apartment for dinner. Here she was, in her early 20s, and her 3 guests are Bogie, Tracy and Hepburn! She felt a little intimidate but the evening went great. 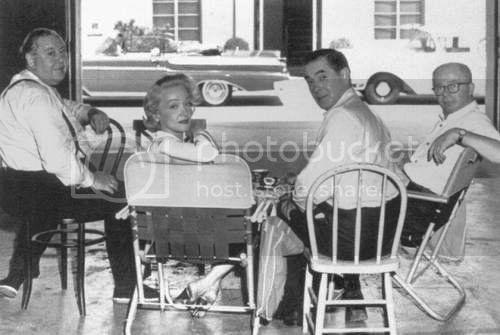 The topic of 'why don't the two of you do a movie' was mentioned and both Bogie and Tracy wanted to work together but the billing issue wasn't revealed to her until much later. Laughton long ago had accepted the fact that he was far from good looking and was therefore not a "leading man" type who would normally get top billing. He was satisfied with the fact that he could act rings around just about anybody. As for Mr Tracy and Mr Bogart, I am a fan of both and admire much of their work. But it appears both men had a high level of insecurity even when they were at the peak of their fame. The '50s was a time when the studios were letting their former acting big guns go for cost savings reasons. When Tracy was fired by MGM from Tribute to a Bad Man for his difficult behaviour he broke down in tears to director Robert Wise: "That's the end. My career is finished. I'll never work again." Of course, that didn't turn out to be true, and he had some big pictures and Oscar nominations still again, but the incident is clearly a reflection of Tracy's insecurity. Likewise Bogart. When I read the Bogie bio Tough Without a Gun I was struck by how insecure the post-Oscar winning Bogart was about continuing to be a top player in Hollywood in the '50s. Even though the actor had a big personal hit in The Caine Mutiny, he was still an actor who had achieved stardom late in life after years of toiling in the Warners cellar in supporting roles. Of note, one of Bogart's favourite films was the 1937 Star Is Born. This film about a washed up film star no longer wanted by the film community would reduce Bogie to tears. I strongly suspect it was because he could more than identity with the plight of washed up alcoholic Norman Maine. So, under these circumstances, with a couple of actors who had insecuries about staying on top, there they were, friends or not, going nose to nose over top billing on a joint project. But it also comes down to the individual. In contrast to them, James Cagney accepted second billing twice in the '50s, in Love Me Or Leave Me (to Doris Day, over whom he has been top billed five years before), and Mister Roberts. And I've never heard that Cagney had a particular problem with it. But during the '50s I get the impression that Cagney was growing increasingly dissatisified with the movie business, and by the early '60s he would voluntarily turn his back on Hollywood and take himself into a tranquil retirement. WITNESS FOR THE PROSECUTION is just darned fun to watch. And the star power of simply the SUPPORTING players is fantastic. That's really what makes it. Lots of fun to see the murder victim ALSO the woman being "strangled" by Robert Walker in STRANGERS ON A TRAIN at the party. But it all comes back to Agatha Christie's one REAL experience with raw life. Her husband leaving her for an adoring younger woman. The lid was lifted off "reality" for Agatha during that horrible time, and she got a glimpse of the REAL WORLD. She then had plenty of raw material to work with in her books after that. THAT'S why people murder---because they LOVE.